This little business card was included inside the wallet. Sadly, the cash and credit cards were my own. 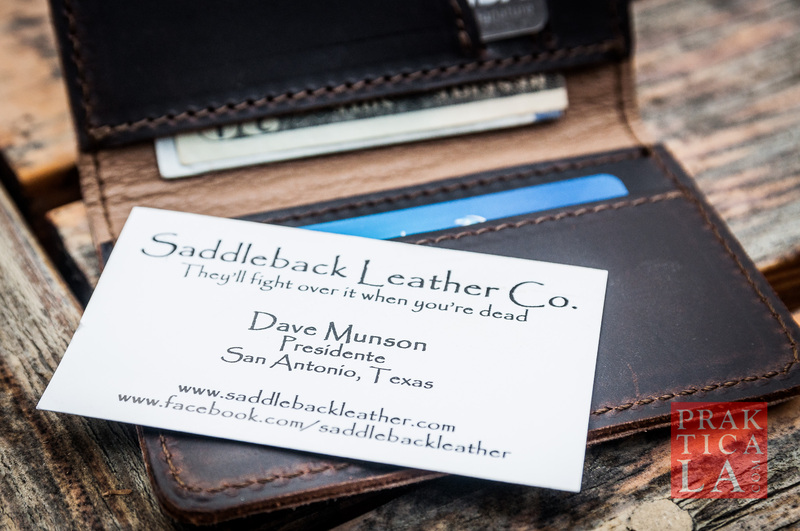 Saddleback Leather Co. makes all kinds of leather goods: wallets, bags, belts, you name it. They use full-grain leather and other heavy-duty materials with no breakable parts. Because of this, they offer a 100-year warranty with all their products! Consequently, many of their products are (at least to the budget-conscious layperson) prohibitively expensive. 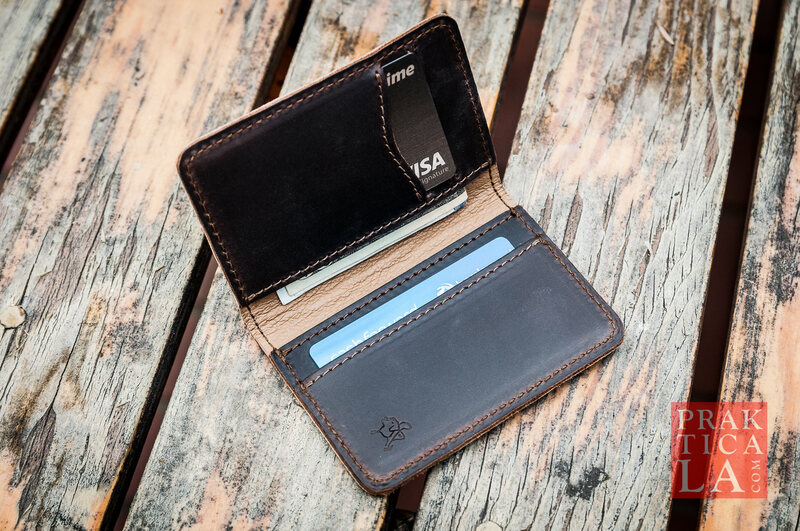 This slim bifold RFID wallet is one of their more affordable products, which is what attracted me. 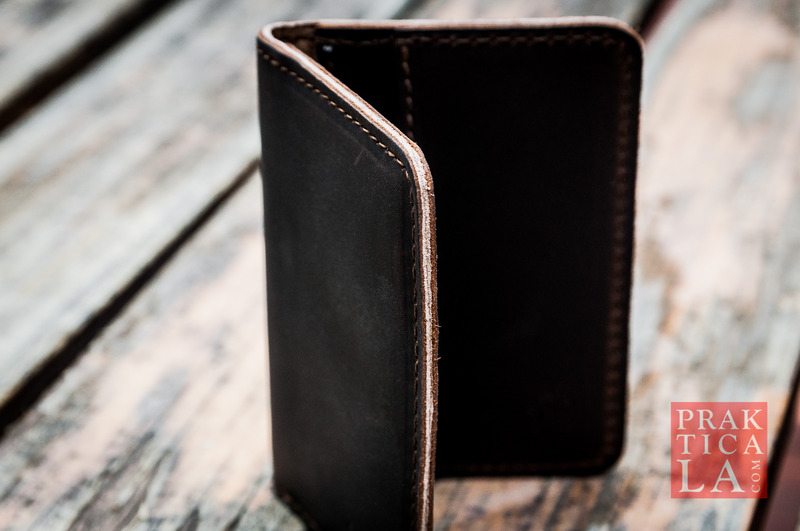 I encountered the same quality issues with wallets as I did with shoes many years ago. 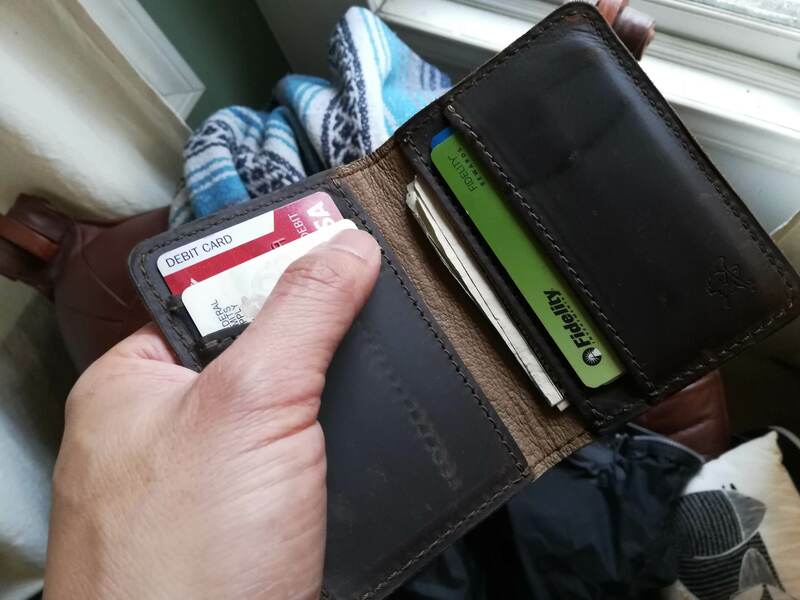 I purchased “leather” wallets thinking they should last a long time, only to find them unraveling and disintegrating after a couple of years. Why? The same reason crappy shoes fall apart – cheap leather and weak materials. 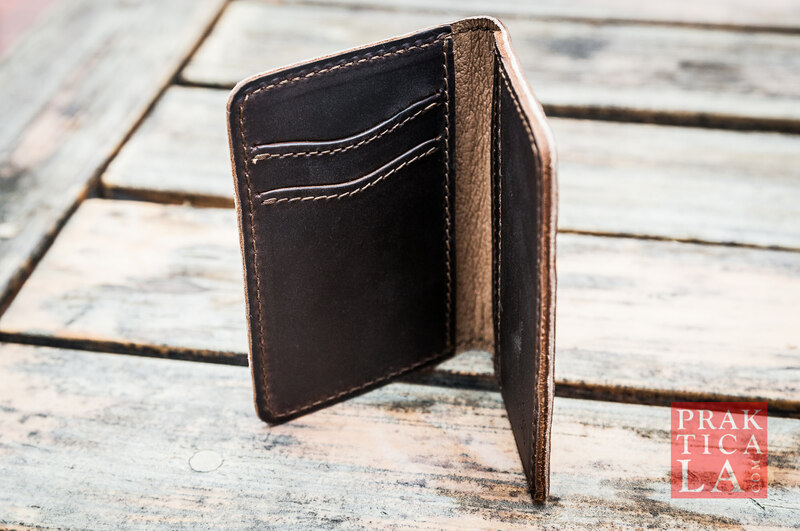 Compared to spending ten or fifteen bucks on janky wallets every two years, spending $39 on a full-grain leather wallet with a 100-year warranty didn’t seem so outlandish anymore. I also want something thin and low-profile, with a limited number of pockets (more pockets = more layers = chunky wallet). Larger wallets had worn holes into my pants’ pockets. 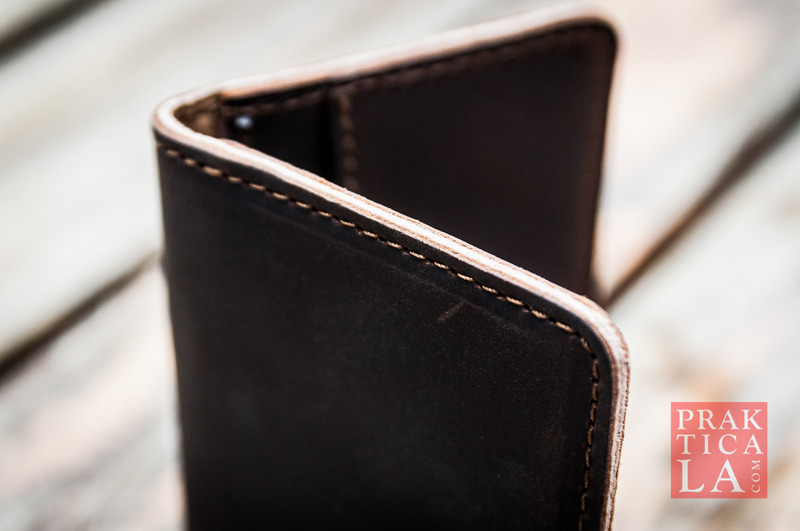 This wallet is only a bifold (as opposed to having three or even four folds) with just one or two card pockets on each side. It sounded promising, so I pulled the trigger. 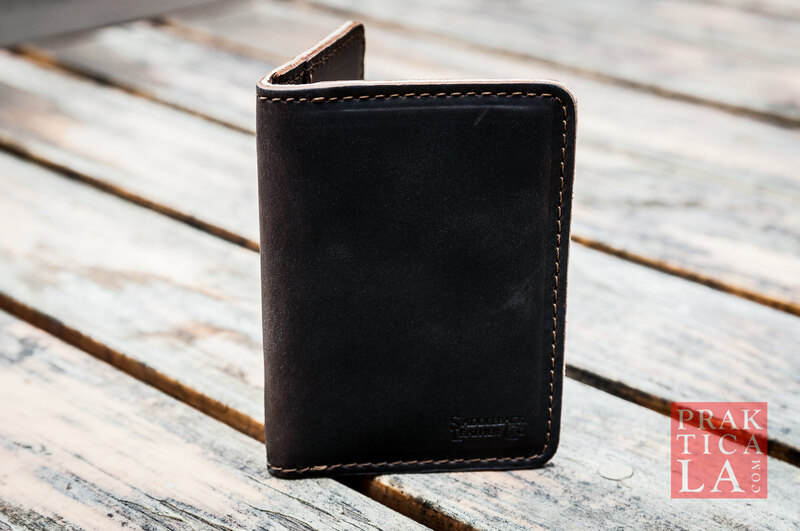 You’ll immediately notice the leather is much tougher and hardier than your usual leather wallet. That’s because they haven’t sanded off all that grain! Saddleback leaves the edges unfinished. According to them, other manufacturers fold and sew over the edges, like a hem, to hide evidence of fake or inferior leather. Their raw edge shows the thickness and quality of the full-grain without having to hide anything. Inside, the stitching looks durable and the pockets are super tight. It was hard to fit even one credit card into a slot! However, after a break-in period, the pockets stretch and adjust themselves to whatever you’ve put into them. I currently fit three cards into the longer single pocket. 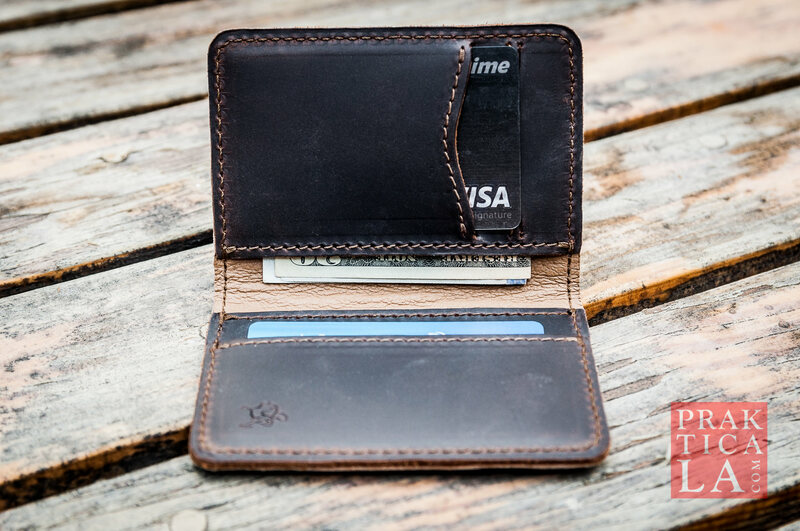 As the name implies, this is supposed to be a “slim” wallet meant for your front pocket. While it is indeed slimmer than some of my previous wallets, it is just a tad too large (especially once it’s full of cash/cards) for a front pocket unless that pocket is empty. I suppose it’s a good motivator for reducing how much useless filler we usually carry around in our wallets – I ditched the credit cards I never use, as well as the random loyalty and punch cards that just sit there taking up space. Worst case, it works just fine as a conventional back-pocket wallet. 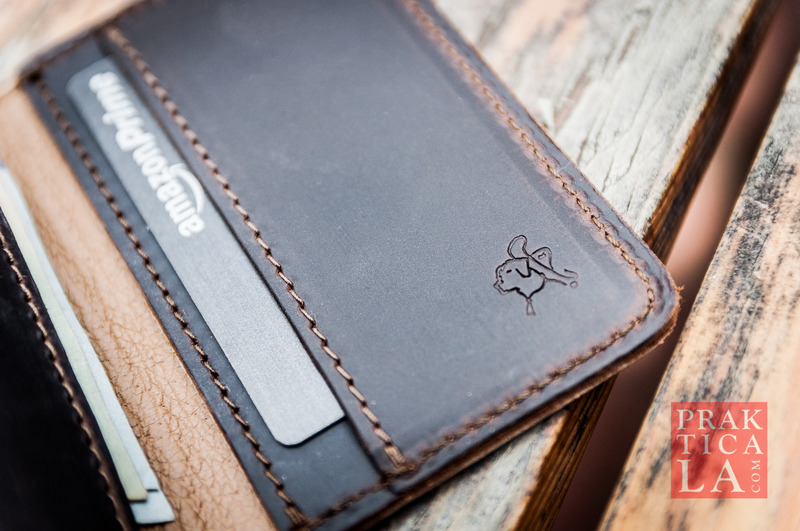 As an added bonus, this wallet is RFID shielded to help prevent “skimming” by thieves. I didn’t get a chance to test this, but I’ll assume it works. I took a couple snapshots of the wallet after three months of regular, everyday use. As you can see, the leather still looks totally intact, despite consistent abuse. The grain has developed a few light nicks and creases (not a bad thing). On the inside, the pockets have molded to the shape of the cards so that they’re now easier to take out. The cards and the stitching have left imprints on the opposing panels. Definitely broken in, but will probably still break in even more and get even more soft. 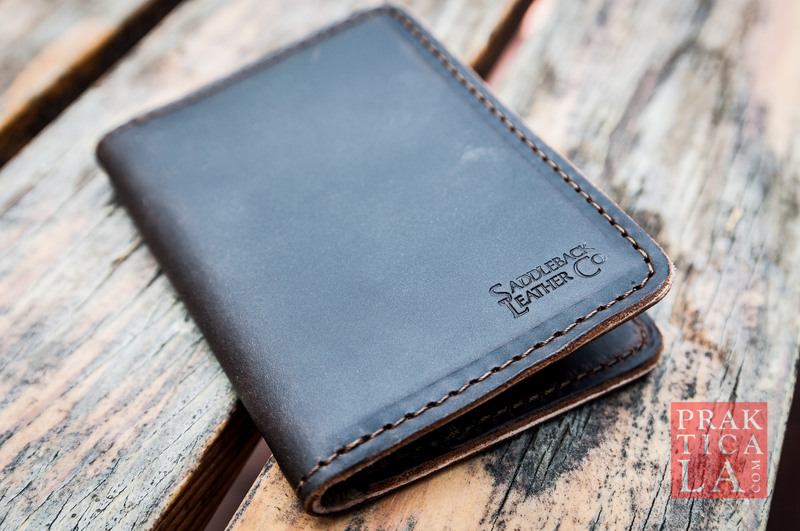 PROS: Not that much more than expensive than cheap, crappy wallets (although Saddleback’s other products can easily cost much more). Solid materials and warranty. Simple and uncomplicated. Looks good! CONS: Not as slim as the word “slim” in the name would suggest. Requires break-in period. 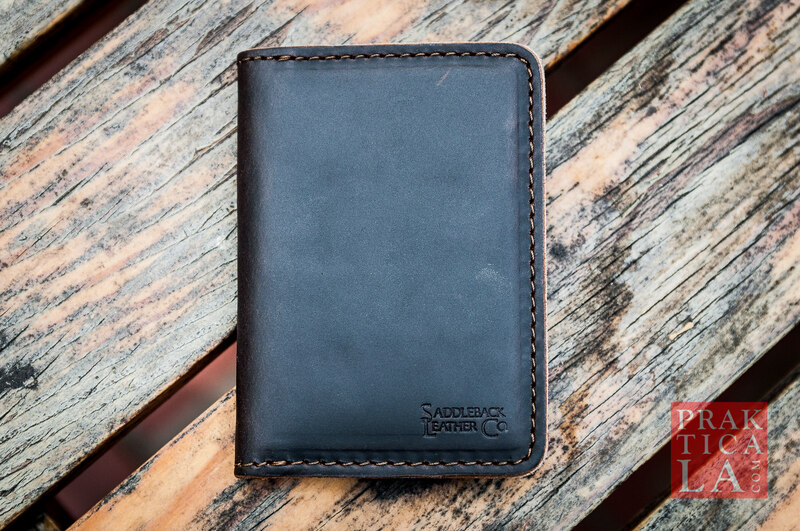 Most of Saddleback’s products come in a variety of colors, including this wallet. You can get it on Amazon here. 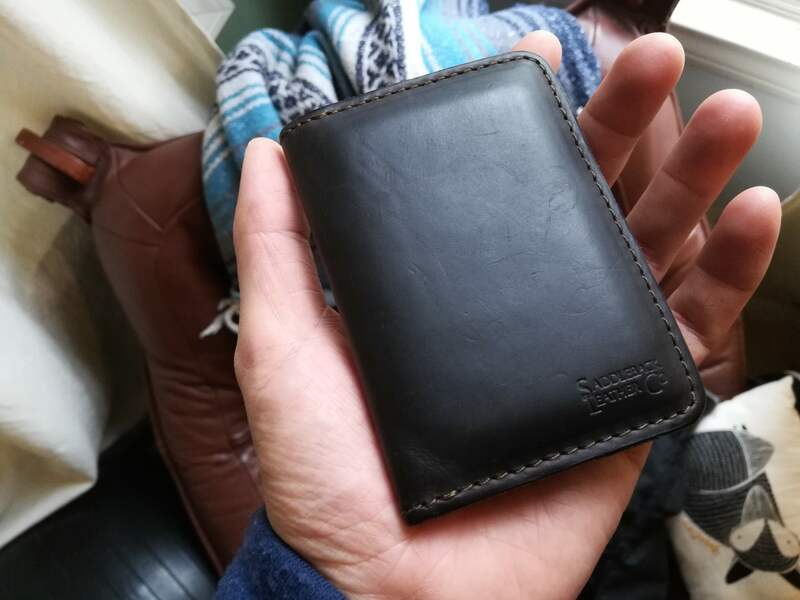 Do you have a Saddleback Leather wallet, or any of their other products? 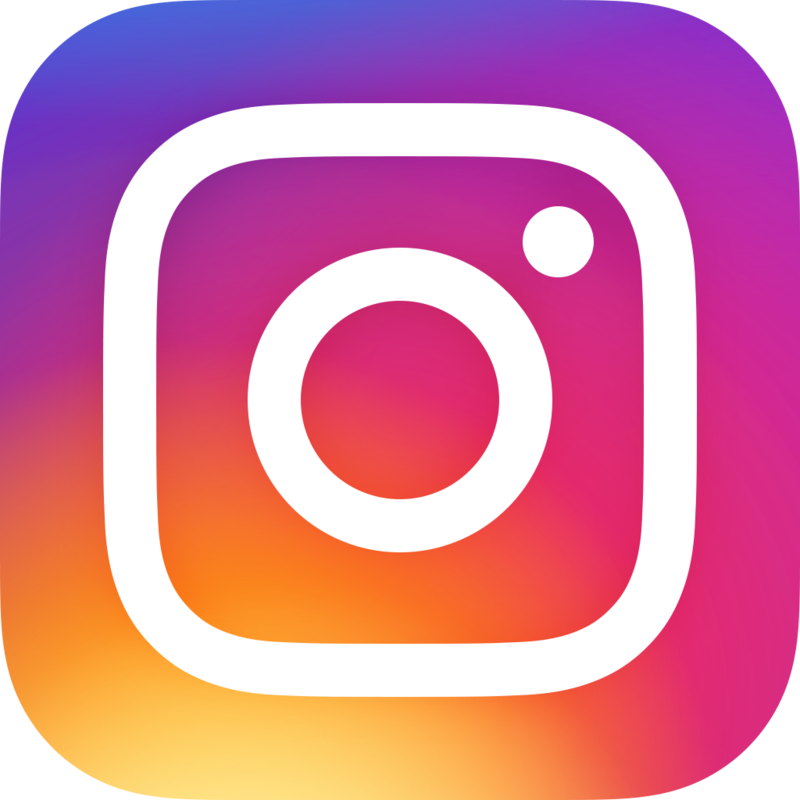 Give us your comments and feedback below!